Looking for a quick and easy chicken recipe your family will love? Look no further. 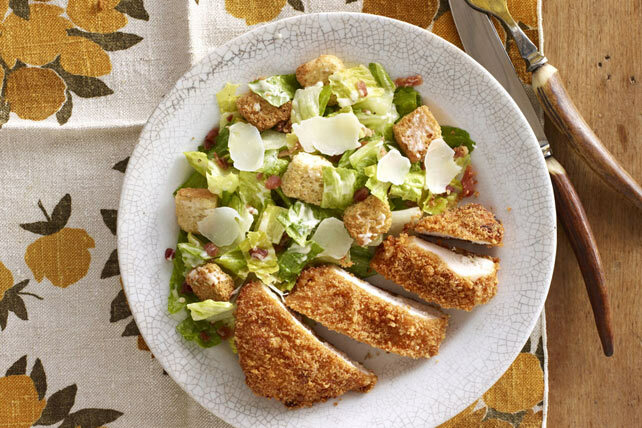 Our Chicken Caesar Pleaser recipe is guaranteed to be a hit. Reserve 2 Tbsp. dressing for later use. Brush chicken with remaining dressing, then coat with coating mix and bake as directed on package. Toss lettuce with croutons, bacon and remaining dressing. Place salad on 4 dinner plates; top with cheese. Serve with chicken. The lettuce can be chopped ahead of time and stored in the refrigerator up to 4 hours. To help prevent it from turning brown, add it to a bowl of ice water immediately after chopping it; let stand 10 min. Spin it dry in a salad spinner, then refrigerate until ready to use. Let the baked chicken stand 5 min. Then, cut diagonally into thin slices and serve over the salad.